A little Star Wars for Minecraft. I will update this Mod and make it much bigger. I don't own Star Wars. If you want to make a Light Saber the first thing you'll want is some Stardust. Stardust is currently (this will be updated in a future version) found (rarely) by breaking grass Legend of Zelda style. It currently comes in three colors blue, green, and red. 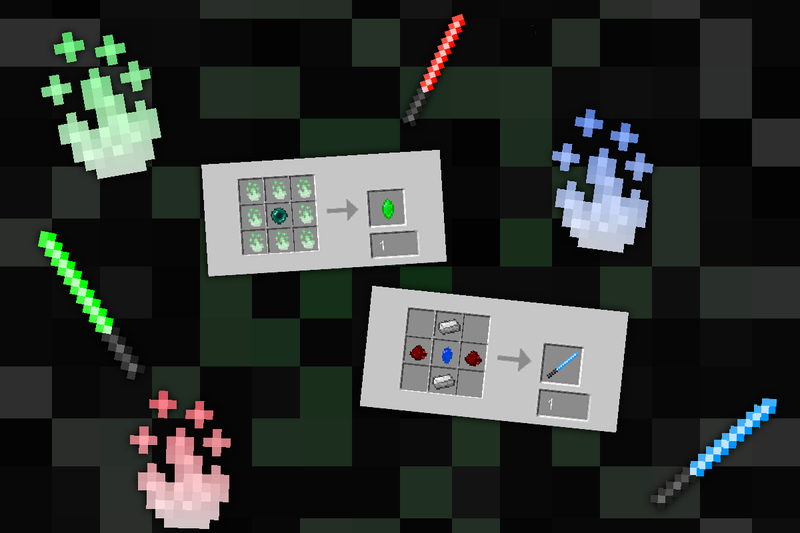 You will need 8 of one color of Stardust and an Ender Pearl to make a Kyber Crystal, the core of a Light Saber (recipe in main image). Now that you have a Kyber Crystal all that's left is to make your saber. Simply place your Kyber Crystal in the middle, place an Iron Ingot above and bellow it, and put some Redstone Dust on either side. Now you have a Light Saber! Give it a few swings and kill some Creepers. Ok... The game is ok.